30 free picture cards! Need a baby or grad announcement? You will need to pay$1.99 postage though, still a great deal! These normally go for as little as $1.29 EACH! I just scored a Buy One Get One Free coupon. You can save too! 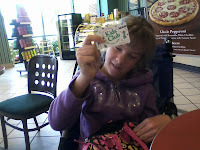 coupons that support your favorite non-profit...Joni and Friends is on the list!! I just signed up to a website for printable coupons. In order to print them I needed to sign up and choose my favorite non-profit to benefit. Of course I was excited to search and find Joni and Friends Disability Ministry! Each time your supporters clip printable grocery coupons or use online discounts from CommonKindness they generate funds for your organization. CommonKindness shares 20% - 66% of funds received with charities and causes of the consumers choice - at no cost to you! When I look back over the calendar I see that there has not been a full week of school attendance in at least six weeks due to a combination of holidays, in-service days and sick days. I have recently been accusing the person, whoever that may be, of having been drinking while they drew up the school calendar because of the placement of those days off. After Candace had another day at home yesterday she announced "I am bored in my house" despite the fact she had actually gone to physical therapy and the grocery store. But I understood where she was coming from, those 80 degree days were such a tease and we are ready to move on to a change of scenery. She asked if we could see a movie on today's "half day", but I didn't see any worth taking in and so I set myself into a panic as to how we would keep her entertained. I was in no mood to go bowling, it exhausts me and makes my head spin, although I am grateful for an accessible bowling alley with ramps. I could serve a full meal on the amount of pottery we have "colored mine", but have blown the food budget to serve said meal on the sitting fees! I am trying to discreetly "lose" stuffed animals around here these days so I don't care to build, clothe, and adopt more.We have visited EVERY free tour in our area multiple times: Ashers, Byers' Choice, local farms, and even the Pearl Buck house...I hope they recovered. I need to find a more economical way to get to the Camden aquarium if we are going to be entering more often than once yearly. And perhaps I need to re-instate our Elmwood Park Zoo passes. 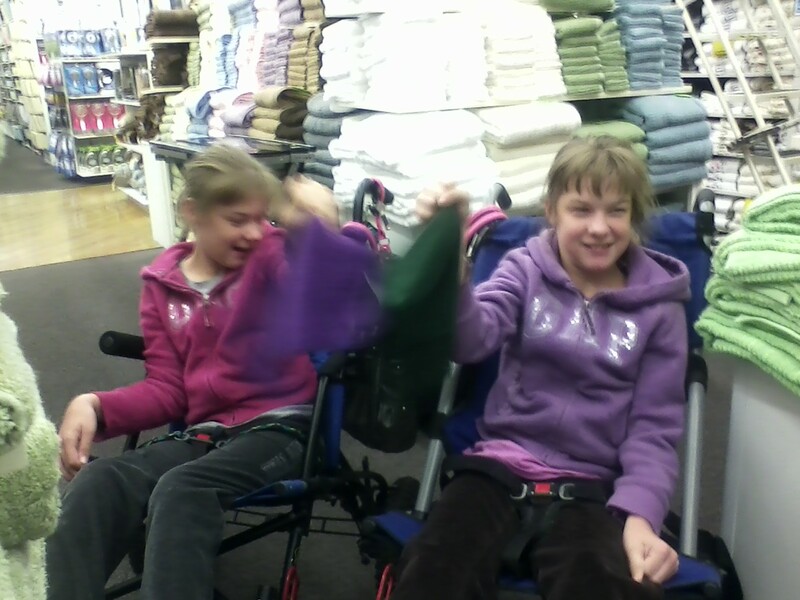 Those who know us know that Candace finds herself bored quite often, frustrated with her confinements and motor skills, and truly embraces the power of retail therapy, even if it is only window shopping. But for whatever reason, the thought of heading to the malls yet again made my head hurt. Believe me, we have hit most of them from the outlets, to the Shoppes at the Promenade, to Peddler's Village, to multiple thrift shops. Somewhere, after searching, googling, and facebook polling, I came up with a plan of my own: an adapted scavenger/photo hunt. Normally I would refuse to do such a thing willingly because of all the loading and unloading that it would require. BUT that didn't need to be the case since I settled on one shopping plaza with each shop being part of our game. It took very little planning, some stores received their directions on the fly as we entered! 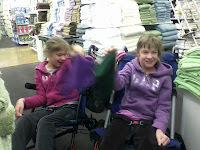 The girls were delighted and, truth be told, it was a pretty fun afternoon! We started with Barnes and Nobles and worked our way through each store ending with the Giant Supermarket! 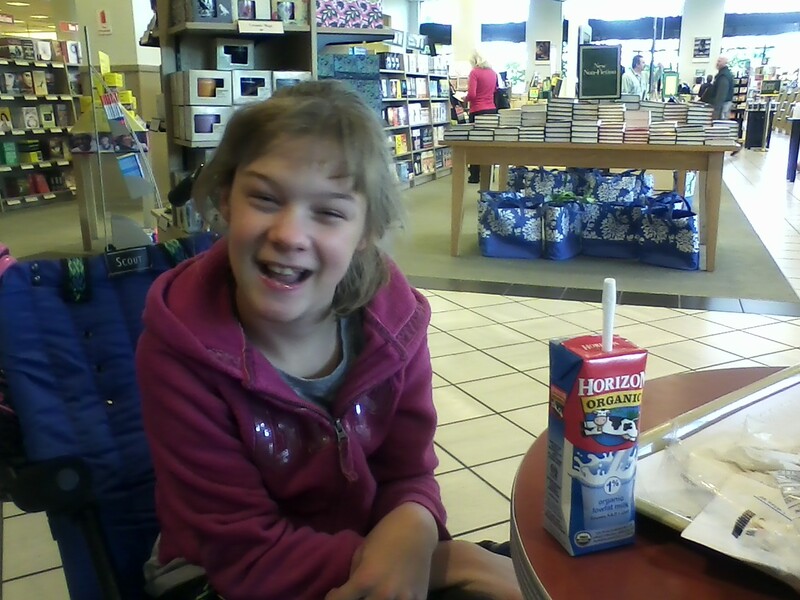 I began at the bookstore after explaining that we are working as one team to meet our goals. 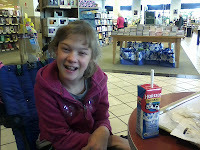 We searched out a book on Maine with pictures (our vacation destination this year), a book by Joni Erickson Tada (the founder of our favorite Joni and Friends disability ministry) and a book about/with a child in a wheelchair. We needed help with these things, but the bonus of seeking out customer service, aside from them needing to voice their requests, was the excitement of signing up for their own Kids' Club card with a promise of a free birthday cupcake! Check that out! After we voiced our concerns that books by Joni need to be ordered in and finding the other requirements, we stopped at their coffee corner for a treat! Next we hit up Bed, Bath and Beyond. We found the different items I described and then they had the fun of choosing their favorite colored washcloth to use in the shower when we returned home. I figured we needed some new cloths and it helped to reduce the pain of going home for showers and routine life at the end of our time out. H.H. Gregg was packed...with employees! Goodness, I counted 9 guys hanging around in an otherwise empty store. I guess we gave them something to talk about! Of course they were tripping over themselves to be helpful. 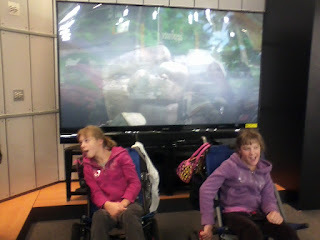 One poor guy tried giving us all the specs and comparisons when we told him we were there to find the BIGGEST TV. He left us alone once we explained and began to take their picture. They were surrounded by huge TV's all playing the last scene of Gnomeo and Juliet, so they could hardly focus on the picture taking! Hey, if the dogs and cats are getting free treats, we need some too! So head HERE to get a coupon for a free can of food from PETCO! Pink Dog is offering a free sample of their dog treats HERE. News from chick-fil-a Montgomery mall...free sundaes today! Today, 4/23/2012, we are giving away free sundaes from 2-4pm. Stop by the mall and try a gooey brownie sundae, a Chocolate Chunk cookie sundae or a delicious and refreshing mini sundae. Sweeten up your Monday!! It's going to be a great week! !